In our last installment we presented a very simple Makefile and taught make how to make sandwich, visiting a few key concepts on the way (automatic variables, pattern rules). For our toolchain to adapt to different situations (out of bread or out of butter? go do the groceries!) and to present some more concepts let’s teach make a few more tricks. The exclamation mark in the target‘s name doesn’t carry meaning, it is only there to show that this in fact is a valid character in a target’s name. Actually, targets are very open to characters you wouldn’t expect to work. You are free to use almost every character (thus forming “patterns” in your makefile, such as “private”, internal targets vs. public-facing targets), except % (see last installment), * and :. The target clean: clean-up-kitchen! without a recipe can be seen as a simple alias in this case: If clean is called, call clean-up-kitchen!. If clean-up-kitchen! is fulfilled, clean will be fulfilled, too, without a recipe. In one of the targets we have used in our last installment, slicing the bread, we defined another prerequisite, bread. This again is so simple, there’s isn’t too much to tell. We define a variable ingredients, holding our shopping list of bread, butter, ham, tomatoes and salad. once the variable is lazily evaluated (see link), the rule $(ingredients): groceries will basically become bread butter ham tomatoes salad: groceries, i.e. multiple targets can be cobbled into a single rule, saving space, refactoring work, etc. Likewise, they could be spelled out one-for-one but why would that be a good idea? If anything is missing, one will need to take care of the groceries — which we will define next, making sure that the whole list of ingredients will be checked, but something will only be bought if it is really missing (i.e. file bread or whatever doesn’t exist). Along the way, we will meet one of the many text manipulation functions of make. This is yet another type of prerequisite, an order-only prerequisite. While a normal prerequisite, that needs fulfilling automatically forces the target to update, an order-only prerequisite will not. It is still a prerequisite of the target but it doesn’t influence whether the target itself needs updating. Maybe a bit far off for now, but remember this for cases where you want to guarantee, that a certain directory exists. It might come in handy. For now, make will clean our kitchen before going for groceries to make us a sandwich. 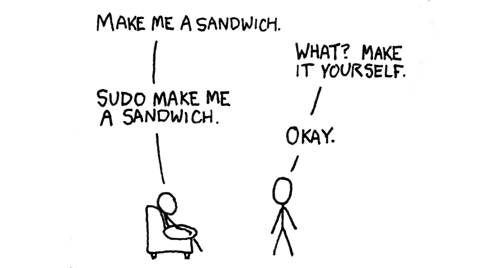 help: ; @echo "Help yourself: 'make sandwich' or 'make sliced.bread' or 'make bread', and feel at home..."
Now as for the usage, make help offers good hints: use make sandwich, or make bread. Make actually allows for multiple targets to be placed after each other and to be run in order, e.g. make clean default sandwich. Another very interesting feature is -n, or --dry-run: in dry-run mode make will display all the commands it would run, without actually running them. One more interesting option is -j, the auto-threading switch. Calling make -j2 sliced.tomatoes sliced.bread could, for the sake of the pattern rule, spread out to two CPUs and do the slicing in parallel. So much for this time. Thanks for reading and hope you’re hungry for make now! Here is why: GNU Make is just plain fantastic, so let’s put this old fella to a test as a and see what it has up its sleeves!